Companies today are facing a tough reality when it comes to employee retention. In fact, talk about retention and most human resource professionals will shudder. It’s extremely difficult now for companies to keep their employees engaged and interested in a job, which is why there has been a drastic increase in employee turnover in almost every organization that is unwilling to change its ways. Having had the opportunity to work in multiple organizations, I have witnessed employees leaving in droves because of poor management and I have seen employees (millennials specifically) staying for years because of excellent management and learning opportunities. I have seen people stay loyal to an organization at its lowest phase simply because they felt valued and cared for. On the contrary, I have seen people make a rapid exit from a high paying job at a mighty corporation simply because they were treated as nothing more than robots having to do meaningless work. There are a number of factors that determine employee turnover and usually it’s not just one factor but a combination of issues that force people to leave a job they love or aspired to love. From management issues to organizational issues, from lack of innovation to lack of employee rights, and from nepotism to favoritism - there are no dearth of factors that lead to high employee turnovers. The tragedy is companies aren’t willing to accept their flaws and are ever insistent on adopting old corporate culture practices that are not exactly aligned with today’s competitive nature. For example, most employees now want flexible working hours because they don’t want to be confined to a 9 to 5 routine, especially if they are able to finish up their day’s tasks in half the time. Decades before the computer and the internet it made sense to work 8 hours, but these days with machines doing half of our work, we don’t even need those many hours. In fact, according to a report by Salary.com, 69% of employees out of 750 employees reported wasting their time at work with 31% wasting 1 hour daily! Social media, emails, chat, etc., all contribute to time being wasted at work. The point is companies fail to see these facts and are reluctant to change their policies to meet real world needs. The result? A consistently high employee turnover rate and everyone involved going through a consistent period of stress. So what can an organization, large or small do to ensure that their employees don’t jump ship two months into the job? 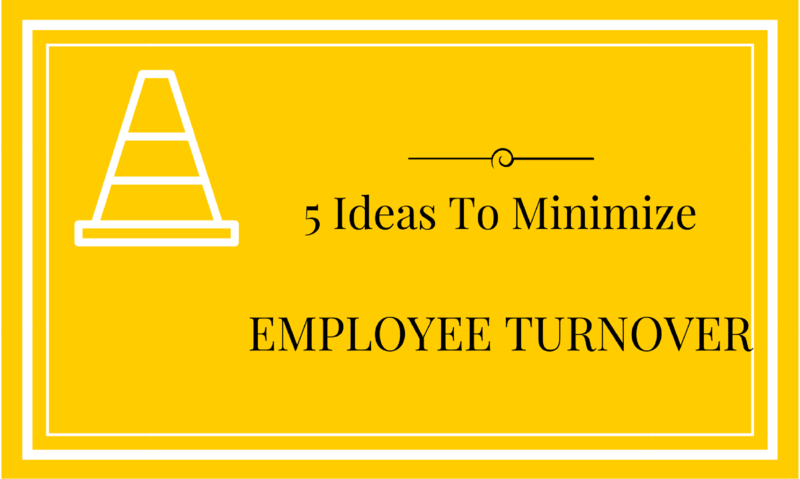 Here are five ideas to minimize employee turnover. Regardless of whether it’s a senior employee or a junior associate, everyone wants to feel respected, challenged, and valuable. Companies often make the mistake of giving senior employees more value and responsibility while neglecting the potential of junior staff members. Remember, it is the junior staff that does most of the work. Challenge them by giving them problems to solve. Ask for their opinion, involve them in strategy meetings, give them the respect they need. A company’s culture is one of the primary factors that either motivate employees to stay or to run for the exit sign as fast as they can. Your managers, your performance systems, your HR processes, etc., all come together to form a company culture. A company that allows its managers to misbehave, to trample on employee rights or to practice power blindly is creating the perfect exodus route for its existing employees. Until you change your company culture, you will continue to see a high employee turnover rate. Hire each person for your organization carefully and ensure that you have the right work for the right man. Most employees leave an organization within two to three months because they eventually figure out that it was not the right job for them to do or they do not possess the right attitude necessary to carry out the job. Skills can be taught, processes can be trained but attitude is what the employee brings along. You want people who are like-minded to your company culture. So someone who wants to work a fixed 9 to 5 routine and is not willing to stay late may not be the right fit for a company that has odd or flexible working hours. These minor details don’t seem important but in fact they become one of the most common reasons people leave a company. During the hiring process, you have to be very upfront regarding the work you have, the challenges you have, and the kind of person you want to tackle those challenges. Let the employee know what he is signing into rather than hiding facts from him. This way you will get the right person with the right attitude to do the job well. Companies often want commitment from employees but when it comes to commitment from the company, they often fail. A company I worked for was going through a rough patch and one of its departments was not functioning well. The CEO of the company decided to shift the employees from the affected department into another department where they would be trained to handle new job roles. He could have simply laid people off but he didn’t and this is why the average time an employee has spent in the company is more than 3 years. During the time, employees’ benefits, pay and everything else was given on time as it has always been. This kind of commitment and value from the owner won the hearts of employees and they have been ever thankful to him, each day doing their best at their jobs. When employees know you will stand up for their rights, protect them to the end and will do whatever you can to keep them stay safe from the ‘lay-off,’ nightmare, they will in return stay loyal and committed to you. Everyone in the company should be provided with regular trainings and learning opportunities specific to their job roles to help them be better performers. And by everyone I mean, even the managers, the senior executives and anyone who contributes to the company. Managers, for example, should be given trainings on leadership and management styles. Senior executives should be given trainings on innovation and growth strategies. The more you invest in educating your team members, the better they will be equipped at performing their jobs and the better they do their work, the more benefits you reap! Trainings alone, however, are not enough. Many companies spend a considerable amount of money on learning sessions and trainings but they never follow up on what the employees have learnt and implemented, which results in the trainings being meaningless. An effective training is one that is well planned, can be connected to a project, and can play a fundamental role in pushing the employee to go beyond his current job scope. You will need to take follow-ups for trainings provided and incorporate the implementation into the performance reviews of the individual. Weekly one on ones are not a thing of the past. Employees today need transparent communication with their managers more than ever. In fact, weekly one on ones have been known to help managers understand their employees better, prevent problems from becoming full-blown situations, and providing necessary guidelines for people to do their jobs right. These channels of communication should be part of the company evaluation and review process that must be carried out by all team members at all levels. The CEO of the company should have a one on one with his reporting members, senior managers with line managers and line managers with employees. It is of utmost importance that a one on one communication be beneficial and fruitful rather than resentful and hurtful. The tone, the direction, and the resultant outcome of the meeting lies with the individual carrying out the meeting. Remember, the meeting is to discuss the way forward, the challenges faced, and to support an employee’s needs. It is not the place for personal arguments, standoffs or grievances. Any such instances should be discussed with HR persons in order to maintain company decorum and culture. It is definitely a challenge these days to keep employees for a long period of time, but it is not impossible. All that is required is the support and flexibility of the organization. Old ways of corporate slavery must be abolished and employees should be given their due share of respect, value, and worth. People today are empowered and know what works well for them. Not to mention thousands of them quitting their jobs to start their own business! Keep your employees happy and you will be happy too.